To properly celebrate the autumnal equinox in Berkeley, I rely on pumpkins to signal the end of summer. Because the seasons can be ambiguous and inconsistent in the Bay Area, we have to make a special effort to denote the seasons. 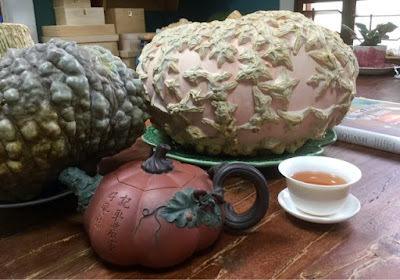 Warty squashes thankfully have their admirers and if I had my way, I would fill up my house with dozens of misshapen varieties. Once I had a tower of blue triambles as our Christmas tree. This year I settled on the blue Marina di Chioggia being more mindful of their culinary ends while my husband chose the peachy Galeuse d'Eysines. Supposedly sugars leaching through the skin is what causes these peanut skin like protrusions so this beauty must be quite the sweet bomb. We have about six months to keep it so I may not split it open until next year. In cooler weather, I find the darker roasted brews more appealing- roasted oolongs and yanchas fitting the bill. I find I've become less finicky and I tend to brew what's within easy reach. I've been going through leftover Wuyi Star yanchas from my rock bottom yancha phase. While I would not bother to buy their De Hong Pao again, it's quite alright on a autumn Sunday afternoon for some warm cozy feels. Them's some good looking punkins.